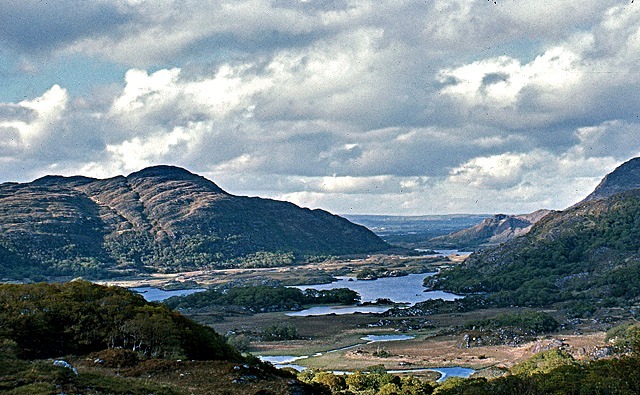 Ladies View, a celebrated panorama of Killarney's lakes, is situated 19.2km south of Killarney on the N71. The hilltop at the second car park commands the view much admired by Queen Victoria's ladies in waiting, when they visited here in 1861, hence the name Ladies’ View. The view from the traditional look-out area is probably the best known of Killarney and is a major stopping point for visitors. There is no perfect time to go there, it is always busy, but with the mountains the best photos would be taken either mid-morning or mid afternoon. At Ladies View you will find Ladies View Industries which comprises of a Gift Shop, Cafe and Bar. The Gift Store has the largest selection of gifts in the area and their prices are the most competitive. The Cafe and Bar will allow you a welcome break from your tour of the area in a most beautiful and peaceful location. There is a bit more to this place than just one vista. If you walk up the road from the gift shop to the first bend and follow the small path to the right, the whole panorama of the upper lake opens up. This is probably more breathtaking and certainly quieter.